We are so glad to release our fifth sewing pattern just before the end of the year, the Yasmeen Skirt! This skirt is one of the garments we absolutely wanted to release when we started Just Patterns. We love the shaped seam lines that enhance all curves in the right places and make it a super flattering option for when you need to dress up. With a Yasmeen in your handmade wardrobe, you are guaranteed a show-stopping outfit but with the versatility of a skirt rather than a dress. The Yasmeen skirt pattern follows the updated look of our information package. It contains information about fabric recommendation and PDF printing. The seam lines are no longer printed on the pattern to provide a cleaner look, but notches are strategically position so that you can check that you are using the right seam allowance. The grey sample shown is made from a mid-weight wool tweed, while the white one is silk crepe de chine. For this pattern, we recommend light to mid-weight woven fabrics with drape such as silk, wool crepe, linen twill, rayon, etc. The quantity of fabric required will depend on the size you make, the final length of your skirt and the width of your fabric. For instance, for a size 46 in 60″wide you need 4 yards. Just Patterns products are meant for for ambitious dressmakers who already know the basics of sewing. In addition to the order of operations, we gather useful tutorials and information for each pattern on our resource pages. 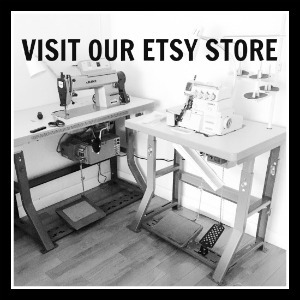 You may have noticed that we decided to make some tweaking to the way we present our sewing patterns. They now have names to be easier to remember and the latest one to be updated is our popular pleated skirt pattern, now called the Stephanie Skirt. We took the opportunity to do some redesign of the information package, the cover is has changed a little but more importantly we now include more information on the style and fabric recommendations. The pattern itself is still exactly the same! We clarified certain areas and added a PDF layout for the print at home options to make is easier to tape together. You can find the Stephanie Skirt pattern in our Etsy Store, don’t forget to check the Resource Page, where we gather tutorials to help you complete your skirt. Little by little we will be updating the packages for our 3 other patterns and we have some exciting new patterns lined up for fall. We will be back very soon to show you more! All the changes were based on the feedback we received from our customers so let us know what you think, we are listening and striving to improve your experience! Whenever you cut a garment on the bias it’s generally a good idea to use the “lost” corners of the layout to cut some extra bias strips. 1 1/2 inch is a versatile width to bind edges or seams, or make spaghetti (rouleaux) straps like we are showing you today! To cut delicate fabric like silk and chiffon, we recommend sandwiching it between two layers of paper. Dotted pattern paper is what we like to use, we buy it locally but you can find it here. After ironing your fabric lay it in a single layer over a first layer of paper. Use the edge of the paper to align the selvedge perfectly. Then carefully unroll the second layer of paper over the fabric. Again align the paper edge carefully to the fabric and the first layer of paper. Lay your pattern pieces over the second layer of paper and draw 1 1/2 inch Bias Strips wherever you have significant remnants. You can store your additional strips by pinning them together and hanging them close to your sewing machine. They will come in handy more often than you think! For the spaghetti/rouleaux straps, fold your strips lengthwise and sew along the folded edge, at no more than 1/8″ (3mm). The secret to nicely rounded strap is to not trim the seam allowance and to use a loop turner. Alternatively you could use thread on a tapestry needle but it will be more difficult. Insert the loop turner all the way through the strap and make a small notch about 1/4″ (6mm) from the end to pull out the hook. Pull the loop turner gently, moving and easing the fabric as you go until it is completely turned out. Congratulations, you made a beautiful strap ready to be installed on your Kate Bias Top or Christy Slip Dress! Disclaimer – this post contains affiliate links to products similar to the ones we use in the pictures.